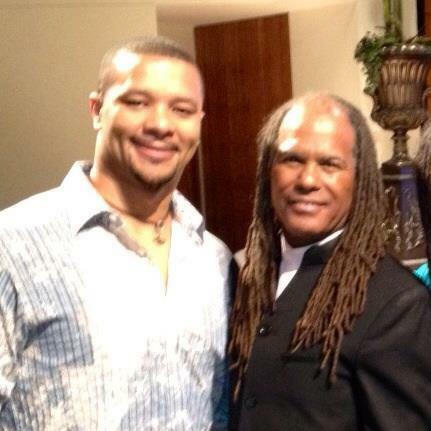 In The Answer is You Michael Bernard Beckwith (pictured with me above) speaks about the futility of complaining. Quoting Bob Marley, he states that complaining is like to praying to the devil. Think about that for a moment. Think about the extent to which you complain about this or that; whatever negativity that happens to befall you at any given time. What I mean by negativity are circumstances that do not feel good. Opening the pressure valve to discharge the negative energy difficult circumstances produce is healthy…to a point. Similar to crying, a venting session can free us of negative emotional energy so we can more effectively address situations. Unfortunately many get stuck complaining and never shift focus from problems to solutions. The notion of prayers to the devil leads us to question what it means to pray and what are prayers? Prayers at a most basic level are thoughts. Whether we are asking for something, speaking intentions into the Universe or simply having a conversation with God, we do this through our thoughts. Those thoughts remain within the confines of the mind or are expressed vocally, always with an emotional accompaniment. “As man thinks in his heart so shall he be.” These words remind us of the significance of our thoughts and feelings in creating the outcomes of our lives. We bring into focus and fruition that to which we direct our attention. I think it is safe to assume that we do not complain about what brings joy, peace and well-being. Therefore if mental and emotional energy is invested in complaining, our focus is on what feels bad. We generally equate what is good with God and what is bad with the devil. Prayers to God are of thanksgiving and gratitude or to restore harmony in an area where disharmony has taken hold. The attention is on what is good; the good we have or the good we seek. Complaining however places attention squarely on what is wrong or bad which is nothing more than communing with the devil. At a certain level of consciousness, what feels bad is not judged as being bad. At that level, all experience is understood as opportunity. If we truly believe there is no such thing as needless suffering, we entertain the question of the need, or opportunity, in suffering. What is the gift in this experience? How is this experience that feels so awful a blessing to me? What trait, characteristic or capacity is this circumstance seeking to draw out of me or develop within me? The questions above shift focus away from complaining. They also represent the shift from victimization to empowerment. We are all victimized in some way, by someone or something through the course of life. Life itself victimizes us in its own way. However, the assumption of a victim identity is a matter of choice. That place above the clouds marks the ascent into the spirit realm; the place of elevated consciousness where meaning and purpose in our experiences is understood. It is the place where we understand that the difficulties we experience are in service to the soul’s growth and reason for taking on the adventure of physical and psychological life. It serves us well to assume this soul-centered approach to understanding and responding to life’s experiences. Pain is part of life, suffering comes from our conversations with the devil; in both we are given opportunity. The glass is only half empty or half full from the perspective of the psyche but as we ascend above the clouds, we come to understand it is always overflowing. I sometimes respond to the question, “How are you?” with the following response. “I could complain but it wouldn’t change things anyway.” That, however, is not completely true. Praying to the devil does change things as it brings into focus and fruition more negativity, disempowerment and suffering. Instead of practicing complaining, practice gratitude. Practice appreciation. Practice thankfulness. Trust that all is in service of your greater good. Embrace all experience, source its gifts and blessings and soar above the clouds where the sky is forever clear. This entry was posted in Psychology, Spirituality and tagged Bob Marley, Empowerment, God, Gratitude, Mark Fisher, Michael Bernard Beckwith, Prayer, The Answer is You, The Instant Millionaire. Bookmark the permalink. Good advice in the final paragraph. In biblical laments like Psalm 10, complaints end with adjustment and praise. Staying mired in complaint is surrendering to evil, or in Marley’s simile, like praying to the devil.